Even though we are catching a flight to Munich today, we still had time to make a couple of great side tours before hitting the airport. 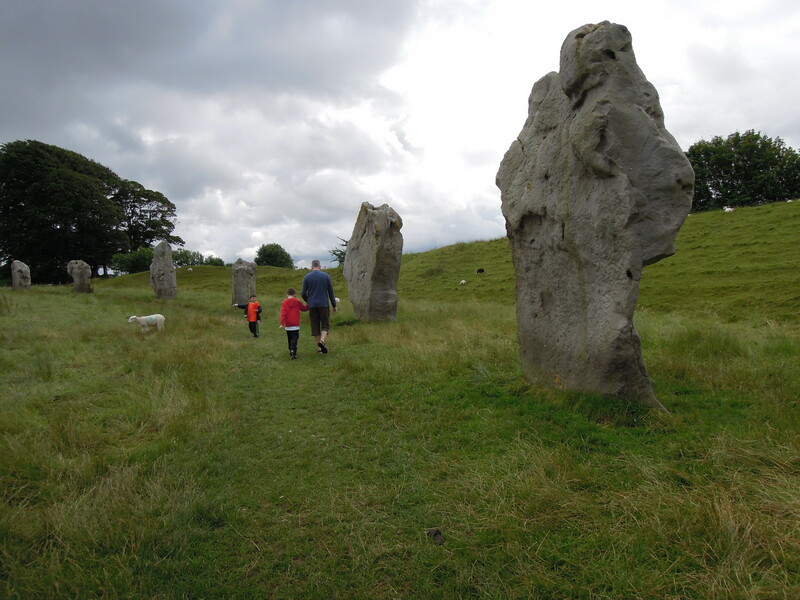 Our host at the Old Rectory suggested we go to Avebury after hearing our plans to go to Stonehenge. The benefits? Ancient standing stones in the largest henge in Europe with no tourist lineups. Plus, touching the stones is OK. I was glad she brought it up because I had heard of it and was hopeful to experience something Neolithic that was not as familiar. As much as Stonehenge is special, it just isn’t surprising. Avebury was misty and quiet. We enjoyed a walk through the green pastureland, dodging sheep poop and watching small hawks as they hunted for their lunch. The standing stones were quite large and followed a large earth henge that encircled the little village. There were quite a number of large burial mounds (barrows) in the area, although we didn’t have time to check them all out. One was an enormous hill that we drove past on our way out of town. It will certainly be worth exploring a second time the next time we come back. I actually think it would be a great place to stay. There were a number of walking and cycling trails that would have kept us busy for a couple of days. Then we were on to Stonehenge. It was not really really busy, lucky for us. Several big tour groups were just finishing up when we came along. It was neat to see it in the flesh, but as with Highclere Castle, I found myself wishing that we had it to ourselves. It also would have been nice to walk amongst the stones instead of seeing them at a distance. Everyone who comes wishes for this. We are now on our Easyjet flight to Munich. I am nervous, as usual. Tomorrow we collect our car and meet up with Dave and Jelena. Then it is off to Zagreb, the first stop on our Balkan adventure!